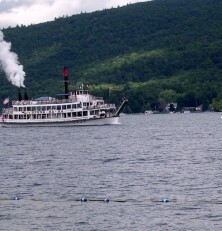 There are literally dozens of places to stay, both small and large, located along US Route 9 in the Lake George village area. National chains, independents, bed & breakfasts, cottages, suites… you name it! There’s something for everyone here. From the south, take I-87 north to exit 21 to US Route 9 north. From the north, take I-87 south to exit 22 to US Route 9 south. The same holds true for restaurants in Lake George village… you’ll find just about everything. Most are located, as with lodging, along US Route 9 in the vicinity of the village itself. You must pick up one of the many free local guidebooks to help you decide where to eat. I personally recommend Trolley Steak & Seafood and Mario’s Restaurant located right in the village. Another great spot is the Log Jam a few miles south of the village at the junction of US Route 9 and NY 149. I recommend that you spend at least one evening just strolling through the shops in Lake George village. There’s an atmos[here here that you won’t soon forget. During the day, take one of the lakeshore cruises that depart from the steel pier. There are a number of packages including dinner and moonlight cruises. If the day is clear, you must take a ride up the Prospect Mountain Veterans Memorial Highway (I-87 exit 21). The 5.5 mile drive offers breathtaking views of the lake and Adirondack Mountains. Outlet shopping is also just a few miles south on US Route 9 (I-87 exit 20). I-87, or “The Northway” as it’s refered to by the locals is the primary north-south route. Exits 21 and 22 access Lake George Village. To the north is Plattsburg, to the south is Glens Falls. NY Route 149 east will take you to Vermont. When I was a child my parents would take me to “Storytown”. I recently returned with my children and was plesantly suprized to find that the theme park was still there… reincarnated as a Six Flags. We spent the day and had a great time!